A few years ago I underwent a dietary change in order to lower my cholesterol. I didn't have much trouble cutting out fatty foods and going on a low-fat diet. There are plenty of products available these days to make it easier. They have low or non-fat salad dressings, cheeses, sour cream and ice cream. They even have non-fat hot dogs and bologna for pete's sake. Mmmm. Potato chips. Greasy, salty, crunchy, tasty potato chips. Mmmm. With tons of sour cream and chive dip. Mmmm. Before my "diet," I could (and occasionally would) eat an entire large bag of chips in one sitting. And I'm not talking about the single serving size, I'm talking about one of those family picnic-sized bags that come two to a box. To me, chips might as well be crack because once I get started I don't have the ability to stop. 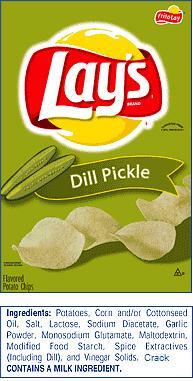 In fact, the Lay's Dill Pickle variety are SO addictive, I'm not sure they aren't laced with it. Maybe I ought to just check the label. Well, whatta ya know. But this doesn't really surprise me. Remember their old ad? "No one can eat just one!" Actually RRD has a sour cream and chive rice crisp that fools me into thinking I'm eating healthier. But I don't think eating the ENTIRE BAG is considered healthy. You have my empathy. Tortilla chips. We go to a Mexican restaurant and by the time the food arrives we've done away with a basket and a half of chips and salsa/queso. Really, I should just order a margarita and make that my supper. Now I'm intrigued. Don't remember ever seeing a bag of pickle flavored potato chips. I"m going to have to remember this one---especially since all I ever buy is regular, sour-cream or bar-b-que!!! Cool Ranch - love em! Never tried the Chili/Sour Cream chips but they sound deliciously dangerous. Tortilla chips - the exact reason I find it painful to go to a Mexican restaurant. Vinegar and salt - very close to pickle except the pickle chips are less "vinegary" and more "dilly." Duh. I think you'll like them. Lemme know! Mom - Don't even THINK about buying pickle chips. That just wouldn't be nice. Pringles must also have crack in it. Remember their saying, "Once you pop the fun don't stop." Just thought I'd bring this up.